Nepal Foreign Affairs (KATHMANDU, 23 December 2018) – The Government of Nepal has confirmed that it had held an intensive discussion on the efforts on establishment of peace in the Korean peninsula and denuclearization. Minister for Foreign Affairs Pradeep Kumar Gyawali stated that he had discussed on wide range of issues pertaining to bilateral, regional and international significance and concerns with the Secretary of State of the United States of America (USA) Michael Richard Pompe during his recent official visit to the USA. Stating that Nepal has been taking a stance on the peace-building in not only in South Korea but also in the Korean peninsula as well as denuclearization as proposed by the United Nations Organization, Minister Gyawali refuted the misleading news about the talks that dwelt on minimizing the Chinese influence in Nepal and encouraging the US influence. “Nepal was not after the USA’s security strategy for Asia-Pacific strategy.” He clarified. Furthermore, the Minister shared that issues such as cooperation and collaboration between Nepal and USA as well as Nepal’s contributions to the UN’s peacekeeping mission figured the discussion during his meeting with the American Assistant Secretary of Defense for Asian and Pacific Security Affairs, Randall Schriver. Minister Gyawali further shared that the US had assured to develop Panchkhal based Birendra Peace Operations Training Centre into the international standard training centre. Minister Gyawali also said that the Foreign Ministerial level meeting between Nepal and US held in a gap of about two decades remained successful. Minister Gyawali had also met various US officials and briefed about the Nepal’s peace process and the incumbent government’s priority areas. According to Minister Gyawali, he urged the US officials to include the Nepalis goods including textiles in customs free list given by the US to Nepal. Similarly, Nepal-America Political Consultation meeting was also taken place during this visit. Foreign Secretary Shanker Das Bairagi led delegation held discussions on Nepal government’s developmental priority areas, implementation of bilateral cooperation, Millennium Challenge Corporation (MCC) compact, development aid, trade and investment with US officials in the meeting. Besides different aspects of bilateral development cooperation, views on possibilities for further cooperation and future development assistance were also exchanged. 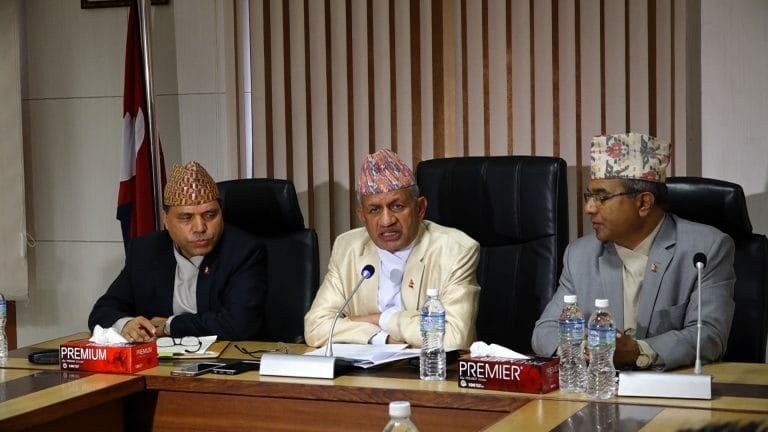 Both the countries have agreed to expedite the implementation of the projects of 500 million US Dollars under the Millennium Challenge Corporation Compact signed between Nepal and the US last year. The bilateral relations is regarded to have further deepen from the recent high-level meeting between Nepal and US and sharing of Nepal’s realities on political achievements, development priorities as well as the priorities of the foreign policy. Similarly, the concerns and importance towards Nepal from the US is expected to further promote mutual assistance and cooperation. Though no agreement was signed for the new development projects in Nepal during the US visit of Minister Gyawali, the officials from the Ministry of Finance and Home Affairs accompanying Minister Gyawali in the trip termed the visit fruitful for our development needs and priorities.